On a warm summer evening Georgina, manning the Hospitality Desk, gave an even warmer smile to welcome our members and guests. Our Sergeant at Arms, Neil, started the meeting by telling us about the wonderful biscuits that he had bought us for break, so that we couldn’t wait to try them. Thanks also to Simon, who brought in some extra special biscuits, which he donated to the club. Neil then handed over to our President, Paul Andreas. Paul announced that he had been looking for ways to encourage each other and had updated the club’s website with some useful resources. Our Toastmaster for the evening was Karen who introduced her team. 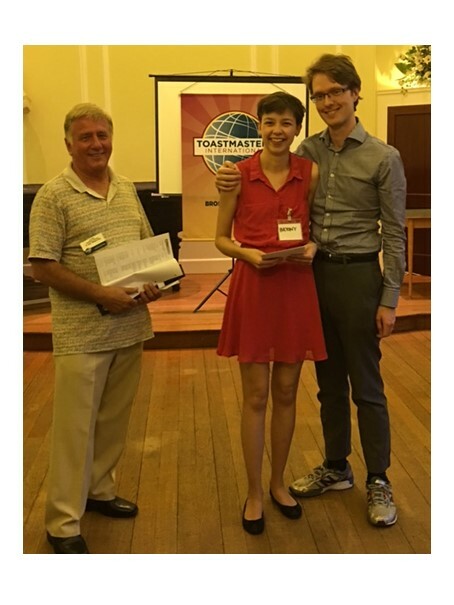 Bryony was the Timekeeper, Alexis the Ah Counter and Derrick the Grammarian. They all did a wonderful job. Georgina led The Warm Up by asking us to share things that we like to do this hot wether, which was very relevant. Royston gave us a Hot Tip about setting goals, which is to act on a consistent basis with deadlines. Don’t try to be perfect – just do it. Our first speaker was Alexander with speech #2 from the CC Manual called “Life in plastic: It’s fantastic?”. This was an entertaining and informative speech about how the plastic industry has developed following the invention of Bakelite by Leo Baekeland. Bakelite was the first synthetic plastic. Next was Riya with speech # 7 from the CC Manual called “Latest Love of my Life” which is her hoola hoop. Riya told us how she was advised to take up hoola hooping to develop her abs, how she researched which of the three types were the best and then showed us some moves. The speeches were ably evaluated by Alain and Richard G respectively. Alex had the daunting task of evaluating thirteen table topics, which he did very well. Well done Alex. Our General Evaluator for the evening was Paul L who gave us lots of useful feedback. Our President, Paul A, presented the Awards. Neil and Alexis were joint winners of the Best Table Topics. Neil’s winning speech was about, “Which day of Your Life Would You Want to Relive”. 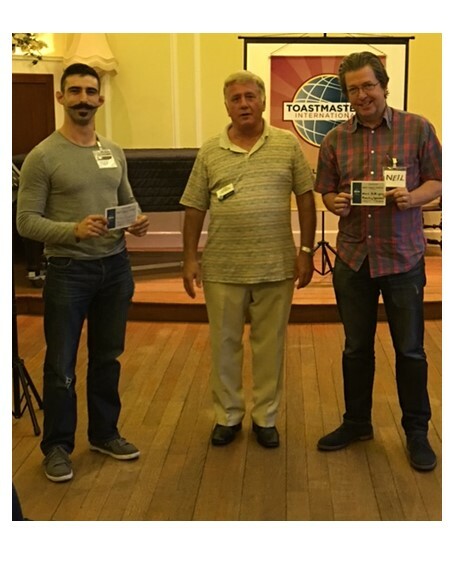 Of course, Neil said it was the first time that he attended Toastmasters, ten years ago. Alexis told an entertaining tale about the night that he got pulled over for speeding. 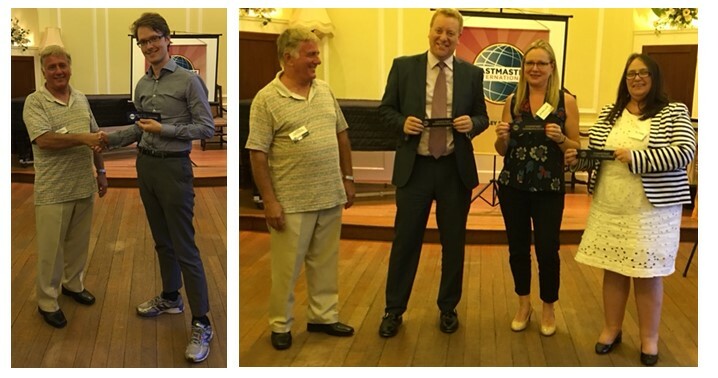 Paul then presented some ribbons to members who had recently completed their Ice Breaker speech or their Competent Communicator Manual..
Two of our members, Bryony and Alexander have recently married and Paul presented them with a card signed by all the members. Congratulations Alex and Bryony. Paul A then drew the meeting to a close by reminding everyone to come to the Annual Dinner at the Bickley Manor Hotel on Thursday 6 July. A big thank you to all those who took on roles, gave speeches and helped to make the evening a great success. This will be held on Thursday 6 July when our existing Committee will handover to our new Committee. Tickets are going fast. Contact Jenny Taggart and book up while you still can. This is also our 25th Anniversary Dinner and we want to make it special. We are hoping that some of our past presidents, past Area Directors and our new Division Director will be able to attend. We also intend to create a new website page called videos and load up to it some videos of educational speeches that we have had at the club, such as Body Language and Table Topics.